Why Alternative Dispute Resolution (ADR)? It is now widely recognized that in many cases the clients can obtain better results through ADR than through conventional litigation. Due to the costs of trial and because many cases don’t settle until the eve of trial, it is sadly the case that attorneys’ fees often outstrip the value of a particular case, giving the client with the “deepest pockets” an unfair advantage. Especially helpful in trade secret cases or those involving personal matters such as dissolution cases. ADR is a consensual process. The parties make key decisions. They select the provider of services and control the timing and pace of litigation. They establish the discovery and pretrial procedures that work for them. Direct participation of the parties usually means their particular needs (be they emotional, financial, etc.) are met in a way not generally addressed in a courtroom. Also, parties who agree upon an outcome often are more inclined to adhere to those agreements. Uncertainty is an abomination to the business person. Deals don’t wait. Expenses must be kept in check. Business clients are sophisticated and know that litigation costs are terribly high and better results can be realized through ADR. Why not take the lead and suggest the ADR modality best suited to your client’s case? 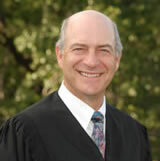 Why Judge Albert P. Dover ( ret ) as your provider? Both professionally and personally, I find enormous satisfaction seeing the burden of a dispute lifted off a party’s shoulders. As a mediator, having successfully mediated the vast majority of over 450 disputes since 5/1/08, including those with all types of impediments to resolution and involving millions of dollars, I look forward to the challenge and opportunity to assist you. As a trial judge between 1987 and 2007 I had a very high success rate settling complicated civil cases, including medical, dental and legal malpractice, large business transactions, all nature of real estate transactions, construction defect, and multi party personal injury cases; as well as emotionally charged cases involving families in the areas of wills, trusts, conservatorships, guardianships, and child custody. Being an ADR provider requires being multifaceted. Patience, wisdom, sincerity, wit, endurance, confidence, and the hide of a rhino are just some of the traits you want to find. I believe I possess an ample portion of those qualities. I recently completed active judicial practice in 2007, handling many settlement conferences in the Civil and Probate calendars. Even with inadequate time available due to calendar constraints, I settled a very high percentage of cases. Recent active experience also means I am familiar with settlement values, and the results of trials for cases that did not settle. This is valuable information for counsel and their clients in making sure proposals to settle are “within the ballpark” of reason. Listen, listen, listen… it took many years to develop this skill, and it is critical to listen to what is being said while “hearing” what isn’t being said and understanding how statements are received. This is not a skill that can be taught. It comes with life experience, emotional intelligence, and a willingness to invest deeply into understanding the basis of a dispute and the parties’ interests, needs, and obstacles, real or perceived, in settlement. This, with your help, is what I do and what I enjoy. I can handle your matter in a cost effective manner as my billing rate reflects less overhead than most commercial mediation services. See Rates and Fees for particulars. I can handle your matter expeditiously as I am extremely flexible in accommodating counsel and client calendar needs. I understand the needs of business people. As stated above, uncertainty is an abomination to business and a terrible distraction. Business problems are just as serious, and can weigh just as heavily, as the most personal of problems. There is special satisfaction in exploring win/win strategies not previously contemplated by the parties, usually as a result of emotional entanglement. Unwinding misunderstandings and finding creative business-like solutions to problems is especially rewarding. Please feel free to inquire about my experience with your particular type of case if it would in any way assist you in choosing me as your ADR provider. Al Dover, Judge of the Superior Court ( ret ).